Of course I’m 21. Why else would I be wearing this suit? Hit me! Wait! I’m talking casino talk, baby … don’t get all physical. It’s a common expression at blackjack tables and how there aren’t more fights at them, I couldn’t tell you. You’ve got people being plied with alcohol losing fistfuls of money; that just seems like a recipe for some good assault and battery right there. In the film, Kevin Spacey plays their mentor and ringleader. He gathers a talented crew together and preps them to make the game work in their favor, rather than the way we all play it on vacation. Obviously, there must be a reason why he resorts to being the team sponsor rather than do it himself … and that answer is exactly what you think it is right now without even seeing one frame of celluloid. Ultimately, perhaps my biggest problem with the film is how formulaic it is. You’ll see the twists and turns coming as surely as you can catch the hostess coming around to take your drink order. As the film unfolds, it provides only one logical progression for the action and if it manages to surprise you, a quick learning annex course might be in order. I will credit the film for laying the framework for a good ensemble cast, with Aaron Yoo, Liza Lapira (probably best known for her “What’s a Chinegro” line from the “Domino” trailer a few years back) and Jacob Pitts joining Spacey, Sturgess and Bosworth as the card counting crew. The interactions between the team worked well for the most part, creating the audience’s ability to root them on as they stack up their chips. Sadly, the element of the team that worked the least for me was Kevin Spacey. He was a little too smug and arrogant – the role would have benefited from a layer of subtlety. On more than one occasion, he seemed to be mixing Lex Luthor with his tremendous performance from “Glengarry Glen Ross” and I kept expecting him to tell everyone to “go to lunch”. Sometimes less is more. 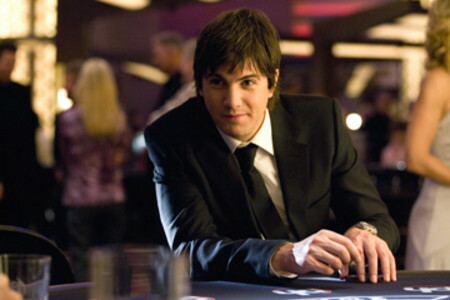 Another element that felt very forced is Sturgess’ transition between nerdy wallflower and card counting pimp. The film begins with him spending all his free time with two other nerds (Sam Golzari and Josh Gad) and not boozing and partying it up as is the normal college milieu. As the card counting delivers money and debauchery to his otherwise bland life, the film keeps using the strain on Sturgess’ relationship with his “old” friends to very over handily point out how different he’s become. Already a notch above two hours, trimming down this element would have helped keep the pace of the film and audiences are smart enough to see the change in his character without being hit over the head with it. Not everything in the film is terrible, though. Watching Kate Bosworth is hardly what I would call work, and I especially enjoy watching her on-screen to see how many times I spot her differently colored eyes (this time I only noted three occasions but I was a little bored in the middle of the screening). Also, Sturgess is excellent and I’m beginning to get one of those vibes about him much in the same vein as I had about James McAvoy before he blew up – cinematically, that is … I’m sure he feels fine right now. I suppose deciding if this film is worth your time and money comes down to what you want from the experience. Do you want something predictable and reassuring, or exciting and challenging? I think you can tell what category I’m placing this particular film into. Doubling down, the last card for “21″ is a 2 (out of 5). Even with a likable cast and interesting source material, it still manages to bust and this is not exactly a sure bet. More blackjack puns are rattling around in my head but I’ll refrain and let you get back to finding a film more deserving of placing some cash down on. Sobering Conclusion is powered by	WordPress 3.1.4 and delivered to you in 0.311 seconds using 36 queries.